I try to always be mindful of those who are facing hardships. 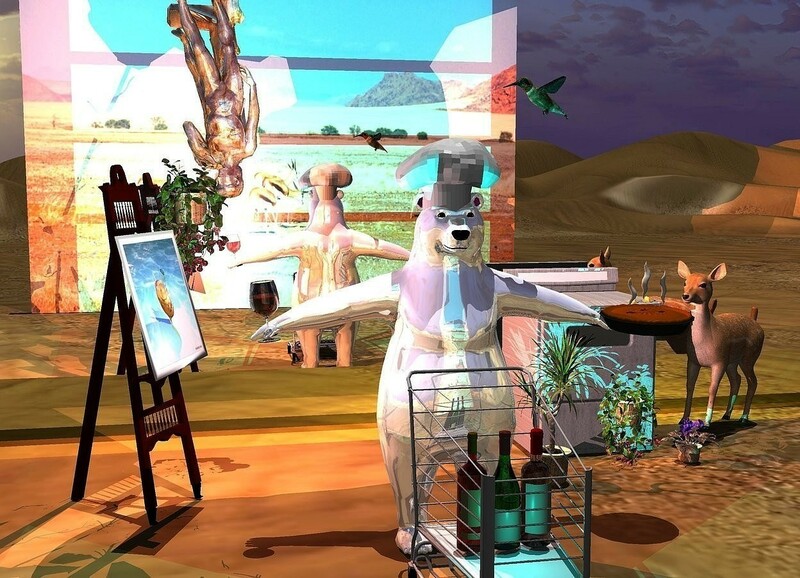 Input text: a shiny polar bear is behind a 4 feet tall shopping cart. 3 large wine bottles are in the shopping cart. a 1.5 feet tall hat is -.4 feet above the polar bear. a large easel is 1 feet left of and 1 feet behind the polar bear. it faces the bear. a 5 feet tall [metal] stove is behind and 9 feet right of the easel. 3 potted plants are in front of the stove. a small shiny [stone] statue is behind and -.9 feet right of and -.8 feet above the easel. it is upside down. a [blurb] painting is -4.4 feet above and -1.4 feet in front of and -3.8 feet left of the easel. it faces the bear. it leans 15 degrees to the back. a 3 feet tall lily is -8 feet above and -1.7 feet left of the statue. a large pie is -.6 feet right of and -3 feet above the bear.it leans 4 degrees to the front. a large wine glass is -.65 feet left of and -3 feet above and -1.7 feet in front of the bear. it leans 6 degrees to the right. the liquid of the wineglass is clear red. a pink light is -.2 feet above the wine glass. a deer is right of the stove. it faces the bear. it leans 7 degrees to the back. a huge hummingbird is right of and above the hat. it faces the hat. it leans to the front. 1st 30 feet long and 25 feet tall [desert] wall is 20 feet in front of the bear. 2nd 350 feet long and 40 feet tall silver wall is 1 feet behind the stove. it is 2 feet above the ground. a coral light is behind the statue. the camera light is dim. 2 lemon yellow lights are behind the 2nd wall. the sun's azimuth is 120 degrees. the sun's altitude is 88 degrees.a cyan light is in front of the wine bottles. this quintessential @Nanook scene is a perfect self-portrait, at least as I know you :-) really love this!